If you sign up for AT&T’s GigaPower fiber-to-the-home internet service in Austin, Texas, you can expect to pay more than twice the advertised rate on plans that include video to keep your privacy and web surfing history intact. AT&T’s GigaPower service, which currently delivers 300 Mbps to homes and will eventually get upgraded to a gigabit, launched last December in Austin. It did so with two different pricing plans, one that cost $99 a month for typical service, and another that cost $70 a month provided users agreed to let AT&T monitor their packets to see where on the web the user has been. In turn, AT&T would sell ads targeted to that customer based on his or her habits. But the $29 more a month to keep your privacy isn’t actually $29 a month. 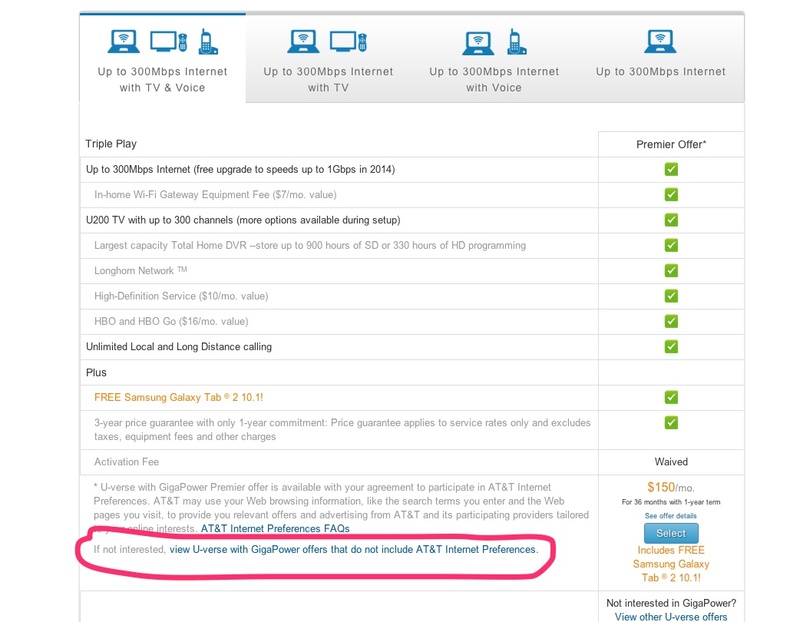 As you add video service, the price differential between choosing privacy and letting AT&T snoop rose to $62 a month for an equivalent package and included a $49 one-time fee (see the screenshot below). Keeping your web history out of Ma Bell’s hands would have cost almost $800 the first year you signed up at the high-end and $531 at the low-end of ordering only internet (there’s a $99 activation fee and a $7 monthly gateway box fee). At the time the pricing plans launched, I hated the idea and wrote extensively about how AT&T’s plans corrupt the way wireline broadband is offered today, adding another layer of charges for something that used to be free. And given AT&T’s complicity in handing over user information to government agencies its deeper knowledge of your web visits is unsettling. It does say it “will not collect information from secure (https) or otherwise encrypted sites,” which may be worth more if plans to make the web mostly https ever come about. 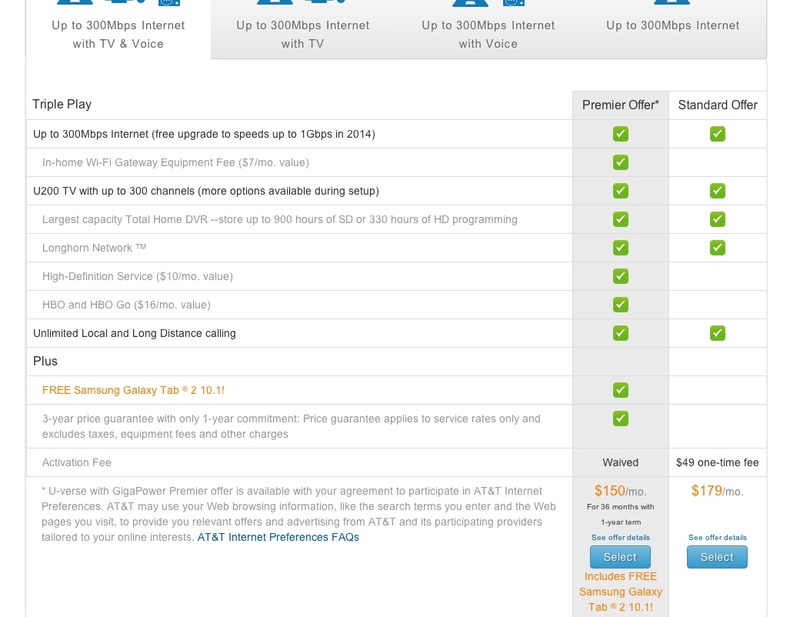 But for such a seemingly bad deal for consumers (charging you $29 a month for something you had formerly gotten for free), I discovered that an overwhelming majority of AT&T customers signing up for a GigaPower plan choose the so-called “Premier” option that strips users of their privacy. (I’ve heard that at least two-thirds and at least three-fourths at different points in time). It seemed so bizarre to me, especially that many of these users didn’t seem to even recognize their privacy was being stolen from them. So I went through the sign up process myself online. Initially a customer looking for a triple play bundle sees the below as the default screen. For any of the bundle options, the default page offers only the “Premier” privacy-invading pricing, even if all you want is broadband. Incidentally, if you sign up for the Premier service you do so under a one-year contract and if you cancel before your year is up, [company]AT&T[/company] charges you $348; or the $29 extra you would pay if you wanted [technology]privacy[/technology] under the “Standard” plan. If you click on the circled segment, you get a chance to see the first screenshot where you can calculate the true cost of keeping your surfing to yourself. Even if you don’t click on that and make it through the sign up, AT&T does tell you one more time that you have just given it permission to monitor your surfing habits. It was at this point that Steve Watt, a tech executive and new GigaPower subscriber in Cedar Park, realized he had signed away his privacy. He tweeted his dismay and I shared our article from the launch. Plenty of Austin residents and those in areas surrounding Austin are in agreement. In the meantime, AT&T has shifted the pricing for broadband in an anti-consumer direction while also misleading people about the costs of keeping Ma Bell out of your surfing history. So it’s clear that while Google Fiber and other gigabit networks are pressuring AT&T to upgrade, it will not go gentle into that dumb pipe. The Post Office needs to offer email, search, broadband, ePhone and anything else having to do with digital communication. This service would be protected by the fourth amendment and it would require a search warrant to look at your emails. The idea that the phone company “owns” your telephone conversations is free market anarchy economics carried to the ultimate extreme, like the water company in Bolivia that claimed to own the rain. Profit is not holy. Hahahahahhaha ATT are such brazen scamps! I will take the lower plan with Tor and they can shove their crap. Broadband is a utility. It’s time for the FCC to play hardball. Tell the telcos and cablecos that they can keep the lines if they are nice. More competition is needed. Then you know very little about Google. SBC finally hones in on Perry’s stronghold…. Just like when the Russians finally overran Berlin’s last bridge….. The only question is whether or not Perry will actually use seppuku as his only way out?? I am from India, and I wish that the media here at least cared enough about privacy to write articles like this. I don’t know why the author seems surprised. Most often, most people choose the cheapest option. Because they can’t afford to not think about the price. Only the few are price insensitive. The main issue with that is that the lambda consumer will never read the tiny lines at the end and sign up without knowing what they really signed up for. This is always part of the plan. Like the tv ads where the “legal terms” are said so fast, even Eminem couldn’t beat that flow… Companies exploit people weaknesses, nothing new, but really not glorifying for them. Its very clear that the vast majority of consumers don’t value their privacy. Is this truly a surprise to you? Trying to get a statistically significant portion of consumer to sign up and set up a VPN is a horrible uphill battle. Sure the tech savvy crowd can partake, but what about everyone else? I also wonder whether AT&T baked in some rules about this in their ToS – that would be rather malicious, but not outside what I am willing to believe they’d do. I detest the “snooping plan” as well, but I love it how the telcos can never win in these discussions. They offer broadband at a lower price, they get attacked. They fight the government, they get attacked. They comply with government demands, they get attacked. They offer more choice, they get attacked. They offer less choice, they get attacked. I guess a tech blogger gotta get paid too, right? Click-bait and circular journalism at its best. Well, better a known devil rather than an unknown angel! You already know Google collects a lot of data, but at least their advertising policies are well known. What is needed here is more regulations (FCC or government) which lay down the guidelines of what ISPs can / can’t do to the network traffic. They’ll never go for it. They would be afraid such regulations could be used against their own attempts at collecting data. I trust Google way more than the telcos; they provide software that is useful. The telcos have, and never will understand software. Never mind that Unix, the basis or inspiration for probably every operating system you’ve ever used, one of the most important pieces of software, was developed at AT&T. Ye olde Bell Labs has very little to do with modern AT&T. How about not offering a snooping plan? How would you feel if a telephone company wanted to record all your phone conversations for playing back later and sending you offers based on what you talked? Google is already an ISP in some cities and people don’t seem to be complaining about them (in fact the only complaint I have seen online is that users can’t run ‘servers’ at home, but it looks like that is not strictly enforced). If Google offers a $70 plan in Austin (we don’t know the cost for Austin yet) it would fall in line with the $65 Grande gigabit plan on offer today. Which puts AT&T’s privacy-preserving offering on the high end at $99. So while I appreciate the suggestion that AT&T is offering lower-priced broadband, it is not. Instead of a discount, where its service might cost less, it is charging more for preserving a person’s privacy, thus forcing users to pay for what competitors will offer for free. That’s a choice only in that a customer can choose to spend a lot more to get what they can get elsewhere as part of a standard broadband package. Under real competition, I don’t see consumers choosing that option very often as long as they aren’t locked in by contracts. We are still waiting for you to respond to the article you wrote about your brother in law’s throughput being significantly less than 300M. Thank you. I’m sorry, did I miss something? What are you waiting for? They can “never win in these discussions” because these discussions are from the perspective of the consumer and they don’t and never will have the consumer’s interests as a priority. When they “offer broadband at a lower price”, “offer more choices”, or “comply with government demands” they’re doing it because it is going to make them more money, period. I don’t know about you but every time my own provider offers me a “new plan” it has consistently been a less-for-more deal. Take some time and read over the new plans you’re offered and, from a consumer perspective, tell me if what you’re reading is a win or a loss. Seriously? That’s what you got from this article? This isn’t about generic providers. AT&T is screwing us. They’ve decided to sell your data to the highest bidder. There are plenty of providers out there providing service without this. Like all of us, they are subject to the laws of this country. But this goes way beyond that, this is selling your data to the highest bidder. Oh please…the poor carriers..what a joke..